NCRI – Upon orders from the Iranian regime, the Government of Iraq continues to steal the property in Camp Ashrafbelonging to Camp Liberty residents and obstruct the sale of them to Iraqi merchants in breach of the quadripartite agreement between Iraq, United States, United Nations and the residents. In this regard, the Iraqi agents affiliated with the Iraqi Prime Ministry office, prevented entry of five Iraqi merchants to Camp Liberty (Camp Hurriya) on Monday, May 5, and another three on Thursday, May 8. These merchants had gone to Camp Liberty to sign a contract to purchase the residents property in Camp Ashraf. The names and arrival times of the merchants had been given to Iraqi and UN officials in advance. The total number of merchants that the Iraq Government has sent them away from the Camp Liberty’s entrance so far has reached to 70. However, in the past eight months, Government of Iraq has stampeded all articles of this plan, much like all previous accords. 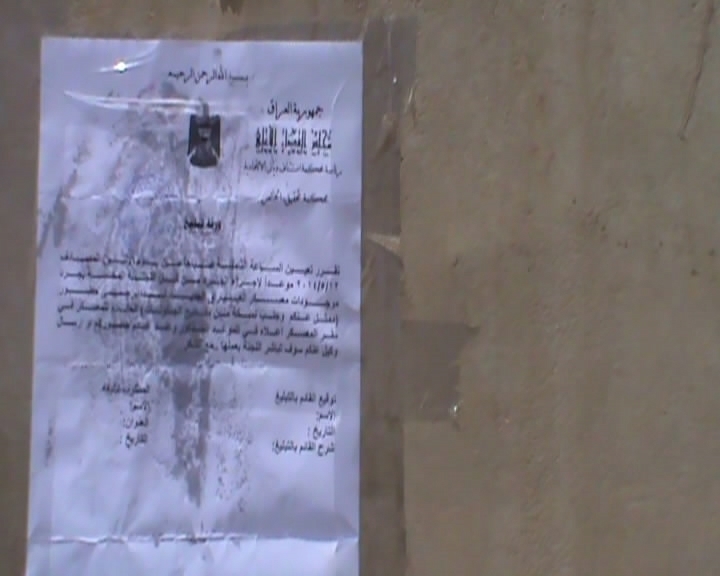 In addition to obstructing entry of merchants, it has strongly opposed hiring of private companies to protect Camp Ashraf property and prevent it from being stolen, and despite persistent requests by the residents and their representatives has prevented a visit by Senator Robert Torricelli, residents legal representative, and his legal team to Iraq to discuss with Iraqi, UN and U.S. officials the resolution of the property issue. Meanwhile, in a misleading attempt on May 6, Government of Iraq posted a proclamation without any serial number, date, signature, and even the addressee or author’s name on Camp Liberty’s perimeter wall and declared that it intends to go to Camp Ashraf warehouses to take inventory which clearly means breaking the locks to Camp Ashraf warehouses and stealing and plundering of Ashraf residents’ property. Reminding the commitments of the United Nations and the U.S. government to Camp Liberty residents, the Iranian Resistance calls for urgent measures to prevent a huge thievery of residents’ property and for an urgent visit by residents’ legal representative Senator Torricelli to resolve the issue of Camp Ashraf property.